Prof. Dr. Hajo Funke was a DAAD/AICGS Research Fellow from October to December 2018. He has conducted studies on terrorism (NSU) from 2011-2018, was Guest Professor on Holocaust Studies and Communication at Touro College Berlin from 2007-2015, and was Chair on politics and culture at the Otto-Suhr-Institute of Political Science at Free University Berlin from 1993-2010. He served as an expert witness in the London trial David Irving vs Deborah Lipstadt (1998-2000) and in various investigation committees of state parliaments on terrorism (NSU) (2014-2016). 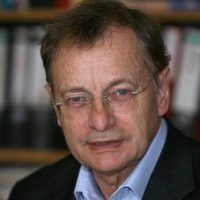 His research focuses on Political Culture in Modern Germany; National Socialism and Post-Holocaust History; Nationalism and German and Austrian Right-wing Extremism; and Conflict Studies (especially South-East-Europe, Mid-East). Recent publications include: with Walid Nakschbandi, Deutschland. Die herausgeforderte Demokratie (2017); with Christiane Mudra, Gäriger Haufen. Die AfD: Ressentiments, Regimewechsel & Völkische Radikale (2018); Sicherheitsrisiko Verfassungsschutz (2017); Der Kampf um die Erinnerung – Nationalsozialismus, Erlösungswahn und Massenmord (forthcoming); Die andere Erinnerung (1989; as E-Book forthcoming). While at AICGS, Prof. Dr. Funke will work on a project entitled, “On Populism and Democracy. 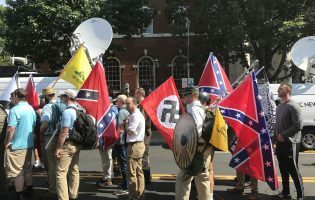 The Case of Charlottesville Events in August 2017 and Chemnitz Events in August/September 2018.” The comparison will give a more precise view of the developments in both cases, especially on the conditions of radicalization by certain organizing groups and their specific, often violent and dangerous parts, particularly their neo-Nazi orientation. Second, he will examine the importance of social and cultural alienation from democracy and how authoritarian attitudes mobilize the kind and extent of radicalization of moods and movements against well-defined minorities who have been declared enemies.